Melt-in-your-mouth linzer heart sandwich cookies will dazzle your beloved’s taste buds. In a panic about what to get your sweetheart for Valentine’s Day? Is your budget too fragile for pricey long-stemmed red roses, a decadent box of imported chocolates or expensive sparkly jewelry? Is another bottle of perfume or cologne too blasé? Do you really want to bring yet another attention-diverting electronic gadget into the house? Not to worry. There’s a simple and much more personal solution: Bake. Many years ago, I began making these linzer heart cookies to share in the newsroom where I worked and to send to friends. They garnered universal praise for their delicate, melt-in-your mouth crumb. As I would go around the office handing them out, I often had to turn down requests for seconds and thirds because other co-workers hadn’t had even one cookie yet. The recipe makes at least 48 cookies, but you’ll possibly have more, depending on how thinly you roll out the dough. I’ve tinkered a bit with the filling, but the basic cookie never fails to please. I’m posting this with plenty of time left leading up to February 14 because you may want to do a trial run of the cookies by making a half-batch. Also, be warned that they are very time-consuming to undertake, which is why I rarely make them more than once a year. The steps are easy and there is extended resting time in between them, so read the recipe carefully and plan your activities/errands/other cooking around this dough. Stored in a tightly covered container, the cookies will keep for at least two weeks — not that they’ll be around that long. A friend I sent them to last year recently discovered five stowed and protectively wrapped in her freezer. She reports that they retained their yumminess after all that time in the extreme cold. Enjoy them alone or alongside a piping hot cup of freshly brewed tea. To make the dough: In a large bowl, cream together butter and 1 cup confectioners’ sugar until light and fluffy. Add egg and mix well. Gather dough into a ball, wrap in waxed paper and chill for 4 to 6 hours, or overnight. To shape the cookies: Cut off about a quarter of the dough and leave remaining ball in the refrigerator while you work. Between two pieces of waxed paper, roll out dough to about 1/4-inch thickness. Using a small heart-shaped cookie cutter about 1 1/2 inches long, cut out cookies. Peel carefully off the waxed paper. A small offset spatula may help in this function. If you rip the heart or the cookies aren’t a pleasing shape, just add the misfires to the other leftover scraps and reroll and recut. If the dough is getting too warm and harder to work with, rewrap in waxed paper and return to the refrigerator. Proceed with a chilled section of dough. The cookies don’t spread or rise while baking, so you should be able to get several dozen on one sheet. You’ll need two baking sheets for a half-batch or four for the full batch. Place each heart on an ungreased cookie sheet. The cookies do not spread while baking or rise, so you can place them fairly close together on the sheet. Repeat rolling and cutting with rest of the dough until no dough is left. Chill cookie sheets in refrigerator for 45 minutes. Bake cookies for 10 to 15 minutes, or until they are evenly lightly browned. About halfway through, rotate sheets from front to back and top shelf to lower shelf. Remove and let cool completely on a rack. This is a half-batch of 61 single cookies. They’re similar to shortbread and can be enjoyed just as is. But filling them with raspberry jam and dunking them in confectioners’ sugar make them even better. The little flecks of color are evidence of the almond meal I used. Spread half the cookies with raspberry preserves (or seedless jam), using 1/4 teaspoon for each. You don’t need to measure, just eyeball it for a thin layer. Use the slightly less pretty hearts on the bottom and the best-formed ones for the top. Sift the remaining 3/4 cup confectioners’ sugar into a bowl. Dunk the front of the top cookie in the sugar and shake off excess. Gently place on the jam-topped cookie and match up the edges. Some jam might ooze out the sides. Notes: To make a half-batch, simply cut the ingredients in half, except for the egg. The dough will be thick. It should be fairly dry, even with a whole egg, but it will hold together. If it seems too wet, add a little more of the finely grated nuts. You can use a larger cookie cutter for bigger cookies. Or use a large one for the base, cut a second of equal size and then with the smaller heart shape, cut the center out of the second cookie. That way, when you’ve put in the jam filling, it’ll peek out the top. I’ve made the cookies substituting margarine for butter and that works fine also. Pecans are my nut of choice, though I’ve also made these cookies with almonds, sold in stores as almond meal (or pecan meal). It’s best to buy the nut meal; grinding your own can result in an oily, wetter meal that doesn’t work well in the cookies. For the sandwich filling, I’ve also melted semisweet chocolate chips mixed with a tiny bit of canola oil for smoothness (use a light touch with the oil; you don’t want to taste it). Using a small, offset spatula, spread a thin layer of chocolate on one cookie, then the jam as above and top with second cookie. You can also pipe decorative lines on top of the cookies or use your favorite icing. As with all recipes, it’s up to you to make these linzer heart cookies your own. For many years — call it very long-range travel planning — I have been reading about Vietnam and Cambodia: books, magazine and newspaper articles, some online sites. Journalist Sydney Schanberg’s article appeared in The New York Times Sunday Magazine in 1980 before it was reprinted as a book. Decades ago, I read Sydney Schanberg’s memory-searing article that appeared January 20, 1980, in The New York Times Sunday Magazine about his friendship with his guide-translator and fixer Dith Pran. When Phnom Penh fell to the communist Khmer Rouge in 1975, Schanberg and some other Western reporters stayed on, taking refuge in the French Embassy. The Khmer Rouge separated the Cambodians from the Westerners, whom they eventually allowed to leave. Pran was left behind. This turn of events haunted Schanberg, imposing on him a soul-searching guilt trip of epic proportion through the late 1970s. Under the Khmer Rouge’s “Year Zero” regime that anticipated making Cambodia — renamed Democratic Kampuchea — a totally agrarian society, cities were emptied of their population. The lives of educated citizens and successful businesspeople were in even greater danger than the rest of the residents because they represented everything the Khmer Rouge despised. While Pran was exiled to toiling in the countryside — later named the “killing fields” because of the thousands upon thousands of corpses and skeletal remains scattered at execution sites, victims of Khmer Rouge murder, torture, disease and starvation — Schanberg worked tirelessly, writing letters to fellow journalists and humanitarian aid groups, trying to find out what happened to his friend. After Vietnamese forces invaded and overthrew the Khmer Rouge in December 1978, Pran returned to his home province of Siem Reap, where he learned that more than 50 family members had died. Through an East German journalist, he was able to get word to Schanberg that he had survived, but Schanberg’s return messages never reached Pran. Pran knew his ability to speak English and French and his previous association with Westerners ticked all the boxes that would imperil him with the Vietnamese, just as they had infuriated the Khmer Rouge. So he decided to make the perilous journey to cross the border into Thailand and enter a refuge camp, where, via an American relief official, he informed Schanberg that he was there. The journalist flew to Thailand and had a joyous reunion with Pran, who, needless to say, was in poor physical condition. With Schanberg’s assistance, Pran relocated to the United States, where Schanberg had been helping to look after Pran’s family, whom he had aided in escaping as the black curtain of Khmer Rouge rule descended. Schanberg expanded the original article a bit and it reappeared as “The Death and Life of Dith Pran” (Penguin Books, 1985, paperback). I decided to reread it after I got home from last March’s trip to Vietnam and Cambodia. What my friend Susan and I saw in the Cambodia countryside around Siem Reap underscores that everyday life remains hardscrabble, with farmers plowing their fields with water buffalo and the back-aching work of planting rice still done by hand. However, the outdoor markets we toured were well-stocked as were store shelves, and the days of starvation under the Khmer Rouge seemed relegated to bitter memory. Conditions are easier in Siem Reap proper, with numerous Western-style hotels, shops and eateries providing employment and tourism driving development. The resilient Cambodians have made great progress in restoring and celebrating their culture. While we were en route to touring the temples of Angkor Wat one day, our guide, “Tony,” made reference that we weren’t far from the “killing fields.” I should have tried some follow-up questions after that disclosure but I didn’t. Tony himself was too young to have been born during the Khmer Rouge reign of terror. But like many Cambodians, it’s likely the previous generation of his family was affected in some awful way. Schanberg’s slim paperback is only 78 pages, so can be read in one sitting. It’s as gripping as I’d remembered it. Coincidentally, the film “The Killing Fields,” the dramatization of Schanberg and Pran’s story, directed by Roland Joffé, was on one of the local TV stations, and I rewatched that after rereading the book. The 1984 film, starring Sam Waterston as Schanberg and Dr. Haing S. Ngor as Pran, is pretty true to Schanberg’s article/book, but it also benefits greatly from Ngor’s dramatic input and his emotionally raw depiction of Pran’s and his shared nightmare, drawing on his own experiences that in some ways mirrored Pran’s. Ngor’s cinematic efforts were rewarded with a best supporting actor Academy Award for his role in “The Killing Fields,” and a host of other prizes and honors. As harrowing as Pran’s story is, Ngor’s is even more so. An obstetrician-gynecologist who led a comfortable life in Phnom Penh — he drove a Mercedes, was part-owner of a medical clinic and dined out with his girlfriend at expensive restaurants almost nightly — Ngor fled the operating room, where he was treating a soldier, when wild-eyed, gun-toting Khmer Rouge teenage soldiers entered it on April 17, 1975. Like everyone else, he was forced to evacuate the city. Like Pran, he realized immediately that he must disavow his former occupation. Ngor lived in constant fear of being betrayed by those who knew he was a doctor, certain that this revelation would mean instant death. During the exodus, he was frantic at being separated from his his girlfriend and her mother, and his parents and extended family. They eventually found one another after days of walking in the countryside. The now-obsequious Ngor, with two Khmer Rouge soldiers in tow on his Vespa scooter, made a daring return to Phnom Penh in the guise of collecting medicine for Angka, aka the organization, that now lorded over the lives of every Cambodian. Ngor used this opportunity to collect clothing, food, gold and his own secreted supply of medicine, all of which he used as barter later to attempt to keep him and his relatives alive. I also reread Ngor’s “A Cambodian Odyssey” (Warner Books, 1989, paperback, 466 pages), written with Roger Warner. His is a terrifying, powerful story of courage, loyalty and interior struggle against a murderous, mind-numbing, ideologically challenged system of government responsible for 1.7 million deaths. In his death-defying four-year ordeal, Ngor — laboring in the rice paddies, scavenging for food at every opportunity (and by food I mean lizards, tiny crabs, ants, mice, etc. ) to supplement inadequate rations — was imprisoned three times and severely beaten and tortured by the Khmer Rouge. In the chapters where he details this brutal treatment, he warns sensitive readers so they can skip ahead. His beloved, Huoy, nursed him through dysentery and malaria, both of which nearly killed him. Without the proper medicine, his return to health (relatively speaking) was near-miraculous. And without Huoy’s gentle and patient attention, and her temper-tempering guidance, Ngor admits his anger likely would have spelled his own end. He was frequently counseled: “Plant a kapok tree,” the underlying meaning of which was to bury all emotion, disguise vengeful feelings and don’t draw any attention to yourself. “Be patient, be quiet, stay calm.” Wise advice, which Ngor repeatedly reminded himself, but found difficult to abide. “Of the 41 people in my immediate family … only 9 survived.” This did not include Huoy. Without the necessary equipment to save her, and still concealing he was a doctor, she died in childbirth. Like Pran, after the Vietnamese invasion, Ngor and a small group made a danger-filled escape over mine-laced terrain to Thailand. He spent months recovering and working in the refugee camp clinics, administering to the sick and injured before coming to the United States. He settled in the Los Angeles area where relatives and some friends preceded him, doing odd jobs, learning English and living in a tiny apartment. Later Ngor became a caseworker at the Chinatown Service Center, an agency that assisted Cambodian, Vietnamese and Laotian refugees. It was through his contacts at this agency that he found out about casting for “The Killing Fields.” At first he wasn’t interested, but he auditioned several times, and changed his mind, seeing the film as a chance to publicize the plight of his country. He found director Joffé genuinely interested in his comments and suggestions to improve the film’s authenticity and generally enjoyed the production process, though returning to Thailand for part of the shooting dredged up deeply depressing memories of misery and loss. Schanberg won a Pulitzer Prize for international reporting for his Times article. He continued writing for the Times, before jumping to Newsday. He died of a massive heart attack at age 82 on July 9, 2016. Pran worked for many years as a photographer for the Times. He died of pancreatic cancer at age 65 on March 23, 2008. Ngor continued to act and work with refugees, and was an outspoken critic of Cambodian politics. He was shot dead in a suspected robbery near his Los Angeles apartment on February 25, 1996. He was 55. Three reputed gang members were convicted, though there is an unproved theory that Khmer Rouge sympathizers were behind Ngor’s shooting, and that a political hit had been ordered — possibly reaching back to Cambodia — to silence him. Some of Ngor’s relatives believe this to be the cause of his death. 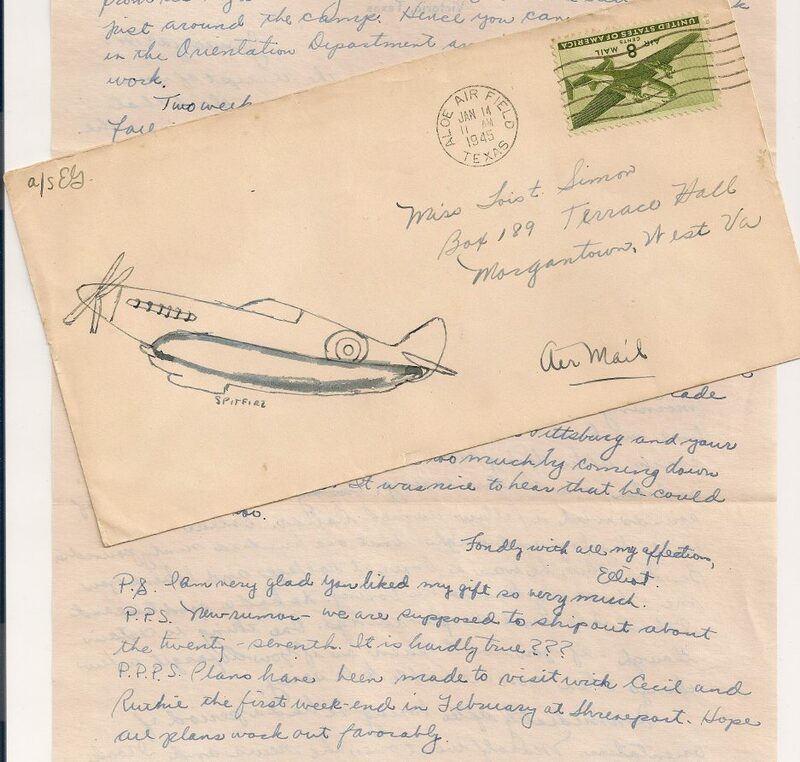 Lois Simon received this V-mail from a cousin who was serving with a radio intelligence unit in Europe during World War II. In the upper left, a censor has signed off on the letter’s contents. The 4 1/2-by-5 1/2 card was folded in such a way that the addressee’s information showed through the oval (above). In the same small cardboard box where I unexpectedly found about 200 letters that my mother wrote to my father during their World War II courtship, I uncovered an even bigger surprise: About 100 pieces of correspondence from other young men sent to the teenage Lois Simon. That she was also extending a normalizing lifeline to other Americans away at war at the same time she was writing her new sweetheart, Elliot Gordon, wasn’t an issue. In addition to writing family members, many Americans also did as Lois did: If they met a serviceman going off to war and he requested that news of home be imparted via mail, they complied. Their letters reveal the world of two New Jersey-reared teenagers, going about their lives on the home front — Elliot at Aloe Army Air Field in Victoria, Texas, and Lois at West Virginia University — while the war’s outcome was very much yet to be determined. Beyond family stories — which over the years may have been embellished or exaggerated — who hasn’t wondered what their parents were like as children, teenagers and young adults? Some of this unadulterated information can be gleaned from old photographs. And some, if the writer was truthful, can be found in handwritten letters. From March 1944, through the end of that year, Elliot and Lois were getting to know each other, having only dated briefly before he was called to duty. The 1945 letters are less formal as they agree that they have become a couple, albeit separated by thousands of miles. Elliot wrote of basic training in Biloxi, Mississippi, going off to advanced classroom training in Tuscaloosa, Alabama, and then arriving at Aloe Army Air Field, where he spent most of the war. When they met, Lois was 15 and in high school in Passaic, New Jersey. She enthusiastically discussed music, voice lessons and having a lead role in the school production of “HMS Pinafore.” Later, as a 16-year-old college freshman, she addressed the challenges of being away from home for the first time, going to “teas” — she had no idea of the etiquette beforehand — keeping up a full schedule of classes and pledging a sorority. The letters my parents exchanged tell their story of friendship turning into something more. The ones Lois received from the other young men communicate a different experience because most of them were stationed outside the United States for part or all of their military service. Their geographical distribution was wide: from the Aleutian Islands to Europe — sometimes from censored locations — to the Pacific Theater, where my father’s twin brother was an Army infantryman. Some letters that my Uncle Fred wrote to Elliot were forwarded to Lois. If finding her letters was unforeseen, finding Fred’s delivered a heart-pounding shock. They were tucked in among the pages and pages that Elliot mailed, and undiscovered until I undertook the task of organizing and preserving my father’s letters more than two years ago. Some of the servicemen’s letters were written on personalized stationary, others on plain paper and others still with the company, squadron or service branch insignia at the top. This is the reverse side of the 8-by-11 1/2 version of V-mail, complete with instructions on how to fold it into a compact size for mailing. During the war and based on a British model, photographed V-mail was developed by Eastman Kodak to reduce the costs and physical space involved in transporting correspondence from the United States to far-flung troops around the world, or bringing their letters home. Reducing the size and numbers of sacks full of mail freed up room in planes and ships for more badly needed medical supplies and equipment, ammunition and other provisions going overseas. V-mail — the V stood for Victory — involved photographing letters onto rolls of microfilm, which were delivered to their destinations, where they were developed as 4 1/2-by-5 1/2-inch prints. Information was limited to one page — a few hundred typed words, more if handwritten in smaller script — so writers had to be concise. Much of the mail had to clear censors, so some that Lois received display bold black lines, usually marking out location or details. Of the nine correspondents, Lois knew two through her drama group and music lessons. Two were cousins. All of them were older by two years or more. Others she met as a volunteer at U.S.O. dances, including one serviceman from Virginia who turned out to be her most frequent correspondent, other than Elliot. What these young men did in the war also varied a great deal. Working off letter content and return addresses, I was able to piece together a bit of their experiences. Of the five that I researched, only one — a cousin — is still alive. Randol, whom Lois knew from a shared music teacher, had spent a year at the prestigious Juilliard School in New York City — he’d even given concerts at Carnegie Hall — before joining the Navy, where he was assigned to a band. A pianist who also could play other instruments, he spent some of his time performing, and writing charts for other musicians while stationed in San Diego. Via some Internet digging, I was able to find Randol’s son. I photocopied all the letters Lois received and mailed them to Florida. Lois knew Sid from her drama group. His letters are a marvelous mix of self-deprecating humor about acclimating to military life and his love of New York theater. In a magical twist, my research turned up the fact that Sid had been in my father’s high school graduating class in Paterson, New Jersey — confirmed by the fact that I have my father’s senior year book from 1942. Sid was outgoing and brainy and must have been very entertaining company. Like my father, Sid had a year of college under his belt before joining the Army. After basic training at Fort Benning, Georgia, he, too, had advanced schooling at the University of Missouri. At one point he thought he might be a translator, but he ended up in the infantry and in England. He and hundreds of other servicemen en route to the Battle of the Bulge were on the troop transport Leopoldville, a converted Belgian luxury liner, on Christmas Eve, 1944, when it was torpedoed by a German U-boat and sank off the coast of England. He survived, but hundreds of others didn’t. After this tragedy, Lois didn’t receive another letter from Sid, or if she did, I haven’t found it. I also made contact with Sid’s daughter through Internet research and forwarded copies to her. That I found his letters so lively didn’t startle her at all. She told me they mirrored the tone of those that Sid had written to her at college. I located one of Lois’s cousins in California. He’s in his 90s. Hal had finished a year of engineering studies at New York University before he was drafted in 1943. His job in an engineering technical intelligence unit was to teach infantrymen about the enemy’s anti-tank and anti-personnel mines and booby traps. While he was in Europe, he let Lois know how important letters from home were. “That’s awfully sweet of you to put off your homework, which I know must be pretty important, just to write me a letter. I don’t know how your letters affect the rest of the armed forces, but they really boost my morale up a few notches,” he wrote on December 19, 1944. Nowadays, service members are lucky to have instantaneous contact with their friends and loved ones via email and video chats. I hope those electronic missives are being archived for future generations too. Near the entrance at … hum in Ho Chi Minh City, Vietnam, a young woman was cutting leaves to wrap around the ends of chopsticks used in place settings. The work station exuded a sense of calm, even when she left for a break. My friend Susan and I took a fascinating two-week trip to Vietnam and Cambodia in March 2016. This is the 15th post about our experiences. As we made our way from northeastern Vietnam, southwest to Cambodia and then to southeastern Vietnam, we were never at a loss for enticing places to eat. Many types of cuisine, other than that of the countries we were in, were represented too — Italian, French, Thai, American — and more. For more on cuisine, see my earlier posts about our Food on Foot tour in Hanoi (June 26), our Bai Tu Long Bay cruise (July 3, 10) and our cooking class in Ho Chi Minh City (Dec. 23, 2016). Not only is the food excellent, and the peaceful surroundings beautiful, but there is a strong social activism aspect in play also. With the temples of Angkor Wat being Siem Reap’s biggest draw, the unsavory side of tourism, such as child exploitation, disease and drug use, aren’t easily eradicated. That’s where Marum can help. The restaurant is run by Kaliyan Mith (“good friends” in Khmer, the country’s official language), a nongovernmental organization affiliated with the Paris-based Friends International, also an NGO, whose goal it is provide education, training and child protection that can lead to better lives. In practical terms at Marum, this consists of employing at-risk youth, some who may have formerly lived on the streets — or worse — as wait staff and cooks, and teaching them the hands-on skills needed to find employment in the hospitality industry. We sat outside at a wooden table, perched on red pillows atop sturdy, woven high-backed chairs. A huge umbrella cast welcome shade over us in the leafy courtyard. Standing fans were helping to circulate air among some patrons. An indoor space in the two-story wooden building behind us was set for a large group. Attentive wait staff are always near for patrons dining at Marum in Siem Reap, Cambodia. One of our waiters was in training. He seemed young and a bit bashful, but also very eager to please, tentatively trying out a few words in English. The young woman mentoring him couldn’t have been more patient or encouraging, with smiles all around. All staff were clad in light gray short-sleeved T-shirts, black trousers and knee-length blue aprons tied at the waist. As I’ve mentioned in earlier posts, we were very careful about drinking bottled water and checking how uncooked greens were washed throughout our trip, and we successfully avoided any intestinal distress. So it’s always rewarding to find a restaurant that addresses these issues upfront, as Marum does on its menu. It clearly states that its “water and ice are pure, our veggies are safe to eat and all our food is MSG free.” It also will prepare food in keeping with diners’ dietary restrictions. The menu (in English and with prices in dollars) also denotes which dishes are prepared in the Khmer tradition, which are particularly popular with students, and which are spicy. This entree, red tree ants, beef, kaffir lime and chile stir-fry, fits the first two categories. From left: Spicy smoked eggplant dip with crispy Indian crackers, roast duck and pumpkin croquettes with citrus hoisin sauce, and Romdeng’s crispy noodle salad with tofu and sweet potato spring rolls. All were delicious and prepared to order. The eggplant was pleasingly creamy and not too spicy, sort of an Asian baba ghanouj. The paper-thin crackers were much like triangular tortilla chips, with just a hint of salt. The heaping, multivegetable salad was refreshing on a warm afternoon, and the spring rolls had just the right amount of crunch. The little, log-shaped duck croquettes were a bit crumbly and heavy, but finger-lickingly scrumptious nonetheless, especially after a dip in the citrus hoisin sauce. Susan also had a lime soda, served over ice, with sugar syrup, poured from a small white pitcher. I noticed other patrons sipping through red straws from coconut halves. The most expensive dish on the menu was baked salmon fillet with spicy miso mirin butter, bok choy and wakame salad at $9.75. Marum is part of the multinational Tree Restaurants, also a socially aware NGO, with these additional locations: Friends the Restaurant and Romdeng, both in Phnom Penh, Sandan in Sihanoukville, all in Cambodia; Makphet in Vientiane and Khaiphaen in Luang Prabang, both in Laos; Bahir Zaf in Addis Ababa, Ethiopia; Sanon in Bagan, Myanmar; and Khanun in Bangkok, Thailand. Restaurant profits are invested in student-trainees and social programs. Elegance and tranquility are the watchwords for this eatery, within easy walking distance of Reunification Palace (formerly Independence Palace, the residence of the South Vietnamese president until the Communists arrived in April 1975), and the War Remnants Museum, both of which we toured earlier in the day. Looking toward the entrance and outdoor seating by the lotus planter ponds at … hum, in Ho Chi Minh City, Vietnam. Vietnamese artwork decorates the walls, complimenting an open floor plan and unfussy wooden tables and chairs and some orange seating. Combined with those elements and white, unadorned place settings, the ambience encourages “a culinary experience that is not only delicious and fulfilling, but also nourishes the soul with peace, healthfulness and grace,” as its website proclaims. Lotus leaves and flowers abound, and diners can sit outside next to a pond planter or upstairs in the balcony. Buddha statues are also featured in the décor, drawing a link to the restaurant’s name. According to the website, “hum originated from the Sanskrit mantra ‘om mani padme hum,’ ” or “om, to the jewel in the lotus, hum.” Think enlightenment through all-natural, delectable food in a calm environment, or “peace comes from within” as the exterior entrance wall informs. The extensive menu features four snacks, nine appetizers, 15 signature salads, 12 options each for rice, veggie and soup and 10 desserts. Because of the growth in availability of international foods in recent years, nearly every ingredient on the menu was familiar, with the exception of cottonii (a seaweed), lingzhi (a mushroom) and kai-lan (aka gai-lan, a type of Chinese kale or broccoli). A wide variety of juices with colors spanning a rainbow and cocktails can also be ordered. From left: Pad Thai, veggies in quattro spice sauce and pineapple fried rice. I had Pad Thai (about $4), because it’s a dish I know and like, with egg, tofu, bean sprouts and green onions. The menu praised its lower calories and carbohydrates, while noting its blend of sweet, salty, sour and spicy flavors. It came garnished with an attractive “flower” fashioned from a carrot. Susan had pineapple fried rice, served in a hollowed-out pineapple half, with the green crown still attached (about $5). The fruit, the menu says, has helpful digestive enzymes and vitamin C. The rice was studded with pineapple cubes, raisins, gingko and cashews. We shared veggies in quattro spice sauce (about $4), which in reality, was more stylishly presented than its name. Three crisp asparagus spears acted as skewers to support pieces of onion, zucchini, yellow squash, red bell peppers and potatoes. It’s hard to say if we achieved “inner peace” with our filling dishes, but we certainly enjoyed what we ate and the overall atmosphere. I asked the wait staff if I could have a couple of coasters as souvenirs. That elicited a quizzical look, but the request was granted. However, I was asked not to photograph them or post them on the Internet. I’ll honor that and just say that the brown coasters are square, of average size, and have … hum in orange italic script in the lower left corner. I have one on my coffee table and the other on a side table in my living room.